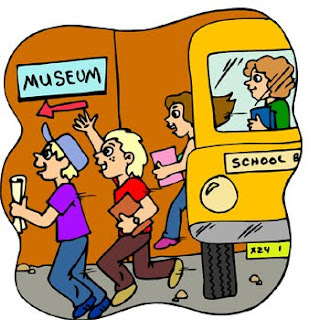 I've blogged a number of times about how valuable I think field trips are. Not only can they be educational, but they present wonderful opportunities to build relationships with your students in new and unexpected ways. We in my grade at TMS2 have been hearing our students' (loud, insistent, shrill) pleas for more field trips, and we are embarking on our second one in a month in a few days. However, there's just one problem: only about 75% of the slots available for the trip are filled. The trip is free, by the way, lest you think financial difficulties might be holding students back. One of my colleagues who teaches a different grade is in an even tougher position. She's hard at work putting together an overnight trip, this intrepid gal, and more than half of the invited students haven't returned so much as the permission slip, let alone the medical paperwork and trip fees. I'm starting to think that what the students really want is a few attendance-optional school days, since the students not going on the trip naturally aren't in school. It really seemed, at one point, though, that the students really liked the trips themselves. They liked hanging out with each other and, God forbid, their teachers, going somewhere new and learning something new outside the classroom. What's going on here? Why will students beg for trips, only to have interest levels hover somewhere between 40%-75% when they actually happen? And in what universe don't students want to go on field trips, anyway?